MEI-MEI: Margaret Li, co-owner with her brother and sister, inside their Chinese-American restaurant in Audubon Circle. Opening this month, the enterprise was aided by a Kickstarter campaign. Margaret Li is finalizing details. 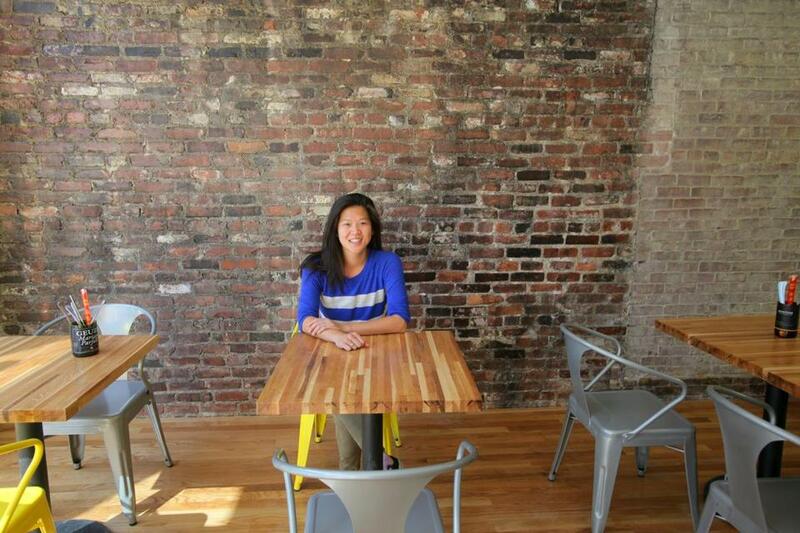 This month she opens her Chinese-American restaurant Mei Mei, a spinoff of her family’s Mei Mei Street Kitchen food truck, near Audubon Circle. But she’s missing an important element — not a grill, not pans, but a wall adorned with names of donors who contributed to her Kickstarter campaign. Their pledges helped to make her restaurant a reality. Online crowd-funding sites allow entrepreneurs to solicit monetary contributions from ordinary people eager to support a new business. Kickstarter is the most prominent, although sites such as Indiegogo also attract followers. The sites are a revelation for those who have traditionally relied on wealthy investors or loans to finance their dreams. Crowd-funding democratizes the launch process; anyone so moved can throw in money with a click. Right now the food world is inspired by the Cinderella story of Minnesota’s Travail restaurant, which budgeted $75,000 and raised more than $230,000 through Kickstarter. Li, who will run Mei Mei with siblings Andrew and Irene, says, “We used Kickstarter because I thought it was an incredible platform for allowing a project that would have difficulty coming to fruition to be realized. It allows people to be connected and to help push through something they believe in.” As is customary, donors receive a reward that corresponds to their pledge level. In Mei’s case, a “backer wall” honors supporters. “People can walk in and say, hey, there’s my name,” says Li. Donors can contribute as little as $5. Consider it the modern version of your very own menu item. Food workers — who aren’t necessarily PR experts or businesspeople — must crystallize a message in a way that traditional financing doesn’t demand. Campaigns require a clear timeline for a project, social media outreach to shore up momentum, and often a video, similar to a political ad, designed to rally donors. Dynamism is as important as talent. 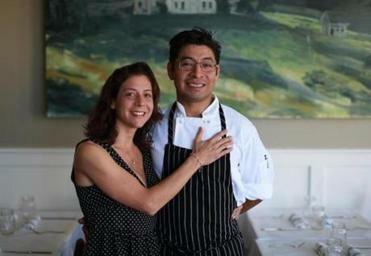 THE FARMHOUSE: Dora Tavel-Sanchez Luz and her husband, Gabriel Sanchez Luz, in their Needham restaurant, which opened in March, fueled by a Kickstarter campaign that helped them buy the rustic door and chairs for the place. 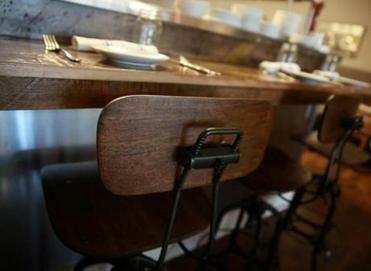 “I e-mailed everybody I know and said, check us out on Kickstarter,” says Dora Tavel-Sanchez Luz, who used it to open her Needham restaurant, the Farmhouse, which debuted in March. “During construction, we had a board outside, asking passersby to look us up online.” It’s the 21st-century equivalent of hanging up a shingle. Relying on the kindness of strangers might seem risky, but proponents say it’s a way to test an idea before going public. Last month Rob Dalton and his wife, Nicole Ledoux, launched 88 acres, a healthy snacks company free of common food allergens. 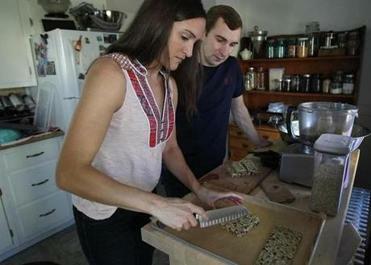 Working out of their Allston kitchen, the pair is using Kickstarter to fund commercial production for granola bars, their first product. “The great thing about the Kickstarter community is that it’s your early adopters. These people are going to be your biggest cheerleaders and brand evangelists. It’s a way to get out in front of a broader group of consumers whom we might not have been able to get in front of immediately otherwise,” Dalton says. It’s an identity campaign as much as it is a fund-raising strategy — and a shrewd owner leverages both. “In my situation, it wasn’t done for capital as much as to raise awareness that our business was coming,” says Michael Dulock, who used Indiegogo to tout his Somerville butchery, M.F. Dulock, which opened in 2012. The other perk is that asking for money this way is less cumbersome than relying on an investor. “It’s a good way to get short dollars,” says Dulock. For food businesses, this scrappy method can be simpler than approaching private investors because “from a business point of view, you’re not giving away any equity. You’re not indebted to a particular investor. You’re basically getting money for free,” says Rachel Greenberger, director of the Food Sol action tank at Babson College, a community of food entrepreneurs who share ideas, information, resources, and relationships. There’s a reason investors might be skeptical: These businesses can go awry. Crowd-funding sites tend to engender more good will from a backer who has probably sacrificed only a few dollars for an intriguing project. Some Indiegogo programs allow entrepreneurs to keep donations if a project fizzles; Kickstarter refunds money if a project falls short, though it can be challenging for a business to recover from a stalled fund-raising attempt just the same. Take Cambridge Community Kitchen, a food business incubator where chefs can rent time in a certified commercial kitchen to start their businesses. Its president, Matthew Stein, launched a monthlong Kickstarter campaign in 2011. Unfortunately, he underestimated the budget. “The problem is the amount of money we raised was just to a point where we could do more serious fund-raising and grant-writing,” he says. “Setting a budget is the most important thing you need to do. We went too low at first.” He hopes to find a location and launch in about a year and a half. “We had a couple of people reach out to us wondering what’s up. We want them to know their money isn’t gone and is contributing to a good thing,” he says. And they become loyal fans before the first meal is even served.